For all of you anxiously awaiting the ability to have a “buddy” Pokemon, the update that enables this feature is now available for Pokemon GO. With this buddy system, trainers need only to walk varying distances to earn candy for their buddy Pokemon. Why is this cool? Well, if you live in a region that does not have many of a certain type of Pokemon, this feature allows you to farm candy for a Pokemon you really want to boost up or evolve. From what I have seen, there are three levels of varying distances to travel. More common Pokemon take just 1km to earn candy, uncommon Pokemon take 3km, and rare Pokemon take 5km. Is this efficient, though? In my opinion, not really, considering that’s quite a bit of walking for just a bit of candy. I’d much rather just have fun randomly catching Pokemon, but that’s just me. To assign a Pokemon as your buddy, head into your character’s menu. 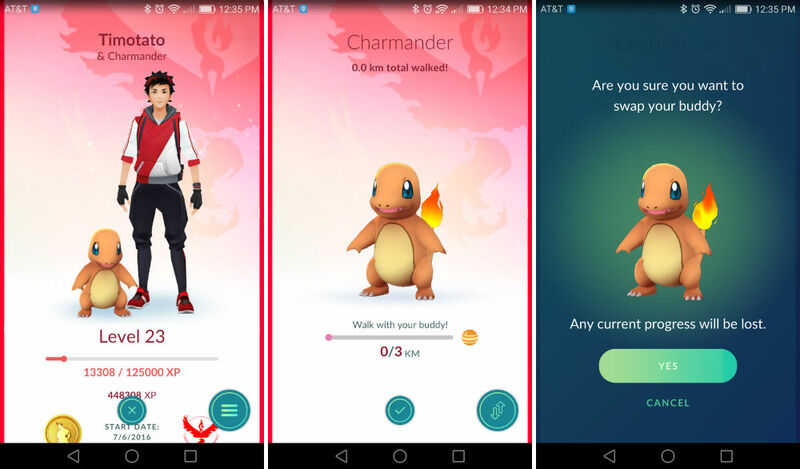 Using the floating action button on the bottom right, select “Buddy.” From here, choose which Pokemon you want to be your buddy. Once selected, get to walking. Serious question, is anyone still playing this game? I stopped once the tracking system was completely gutted.